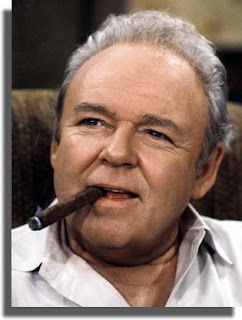 If you're old enough to remember "All In The Family", you'll no doubt recall one of Archie's funniest traits was his ability to mix up words that sound similar (Malapropism). Well my own hubby is following in Archie's footsteps with vigor. He constantly chooses exactly the WRONG word for what he's trying to say. One of his worst mixups is "Blogging". "So you going to be Googling tonight?" he asks in earnest. I shake my head in dismay. "Blogging.... I am Blogging tonight." "Oh. Yeah right." He shrugs and goes back to watching television. At least this time he didn't say "Boggling". You'd think after listening to me go on and on (and on) constantly about my favorite blogs and wonderful bloggers he'd learn. Hey! Now that I think of it, this just proves he tunes me out 99% of the time. But this evening he even outdid himself when he overheard me reminding our nearly 17 year old daughter of her doctor's appointment tomorrow. Pointing to his eyes, he said "What appointment? Obstetrician?" "Optician" I corrected him with a snicker. "OP-TI-CIAN". "Oh. What did I say?" I patted my tummy "You said 'Obstetrician'." "Oooooh...." (The lightbulb over his head goes on). "OH NO NoNoNoNo! Not that!" The look of shock on his face was hilarious. Thank goodness daughter, or her boyfriend, both sitting in the next room, didn't hear him. Oh geeze Uncle! Have my cousin come home and proudly proclaim her successful visit with the obstetrician, that'll learn him (after he recovers from the heart attack, that is). Funny stuff! Too funny!!!!!!!!!!!!!! My kids always laugh because I keep thinking those little things you put in your ears to listen to music on the ipod are called earpods. I remember seeing a movie some time ago where a kid was telling his mom about the subsitute teacher he'd had that day but instead he said "she was a good prostitute"
Cute husband! Do you write these things down? It could make for an amusing anecdotal booklet and proof that, no, he is not suffering from Alzheimer, he has always been this way. ROTFLOL! That was funny! Now, what do you call it when you "get your mords wixed"? Is there a fancy-schmancy name for that? That's what my wife does. For example, last Christmas, opening gifts, she was trying to be funny and declared that all she was getting in a certain gift was the tissue paper stuffing, which came out "Pissue Taper"! My kids and I just roared with laughter, and we make sure to NEVER let her forget! Tee hee! LOLOL!!! Love it! How did you get on with your cardmaking? Not that is right! Yikes! I like the term "Boggling" because I'm sick of the words "blog", "blogging", and blogsphere. They sound so "bloggy". Anyway, I collect malapropisms so if you get any more make sure to send them my way and I'll feature them in my monthly Mrs. Malaprop post. Hee hee. I suffer from this same malady. Yesterday I asked my husband if he could hand me the "specula" when I wanted the spatula. He reminded me we had already visited the gyno earlier this month and I did not need that. Someone I love very much calls my blog posts blogs and they say things like "Funny blog today," or "Did you put up a new blog yet?" Hey Ashley!!! Yeah, but I'd better make sure his life insurance is paid up before we pull that on him. Jill: Har, Earpods! Daughter got a kick out of that one! VE: This is true. I always say it could be worse. Not much. But it could be. Worker Mommy: Har! Prostitute??? That must have gone over well. Blog Bloke: Boogling??? I am not adding to his repitoire. Oh, and thank you so much for the distinction!! Sweet Irene: Ha!!! What a good idea... yes, I may need proof further down the road.... but would anyone believe me? Phoenix5: Dyslexia... ah, a good friend of mine. It visits frequently. And no, my family never lets me forget my slippages either! Momo Fali: He never fails to amuse. Or provide blog fodder. Frogster: Yeah, those NON-Bloggers really need to get their act together and learn something about our hobby, eh?